Combination Play: Benfica - how to improve for next season? Benfica - how to improve for next season? It's always hard, risky and perhaps unfair to analyse how to improve a team that were without any of their centre-backs and were two goals down (on aggregate) when one of their best players was sent off. Nevertheless, even though the Eagles left Stamford Bridge with their heads held high, that's exactly what we're going to do - because there are some specific areas that could - and should - be improved, despite Benfica's valiant attitude. Chelsea and Benfica offered an enthralling battle last Wednesday to see which team would go on to meet Barcelona in the Champions League semi-finals. Similarly to what had happened against Braga, Benfica were willing to break the game in two and take advantage of their dynamic attacking movement. Therefore, it was hardly surprising that, like the match versus Braga, the game was packed with goal-scoring chances, great saves by the goalkeepers and a jittery home crowd. Today we will be considering 3 particular issues: defensive positioning, defensive set pieces and defensive transitions. It's true that Benfica were unfortunate on both matches, but it's also true that Champions League powerhouses tend to make underdogs pay on those apparently minor "details". If the Eagles are to build on this season, they must be humble enough to acknowledge that there is a sizable gap between Portuguese football and this particular European competition - the sooner they own to it, the faster they will become powerhouses in their own right. 1. Defensive positioning. Benfica are often admired for their relentless attacking football, an approach that almost paid off last Wednesday. However, good defensive positioning and coverage are a foundation that any team that aspires to greatness must have. Regardless of how much damage both Bruno César and Maxi Pereira can inflict on their opponent's half, it's just as important that they master their defensive duties - something at which they have failed over and over throughout the season. Maxi Pereira pushes high up to meet Kalou, ending up side by side with Bruno César. 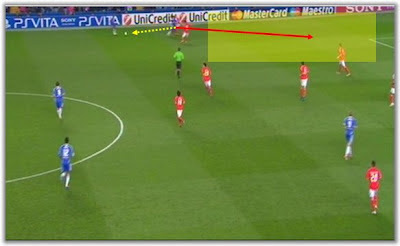 Notice the space behind both Benfica players, with little coverage from Javi García. With a simple one-two, Kalou gets into space and García is already late to cover for his team-mates. 2. Defensive set pieces. It's a well-known fact that Benfica can wreak havoc with their attacking set pieces, but it is less known that they seem to be very vulnerable on defensive ones. 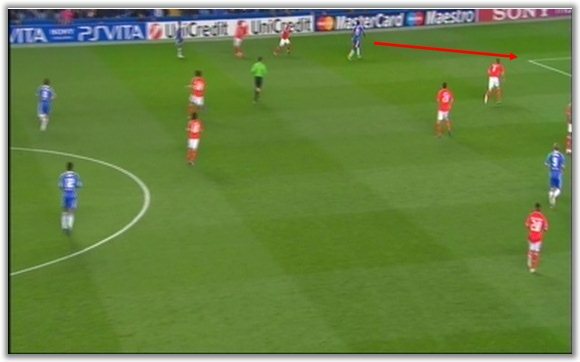 Lately they have conceded against FC Porto and Braga (just to mention bigger games) through this sort of play and here they were fortunate not to allow Chelsea to score from corners, in particular. Despite the recent changes Jorge Jesus made to their zonal approach, there are still tweaks to make if they are to overcome stronger sides. 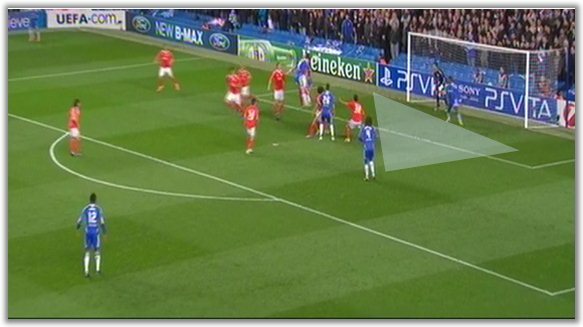 Benfica insisted on concentrating a large of number of players at the near post. As a result, David Luiz ends up alone and unmarked. Notice the space at the far post. After a bad clearance, Luiz gets the ball unmarked and with very little coverage. Capdevila managed to avoid disaster here. 3. Defensive transitions. Probably the single most important issue in modern football. Most teams are aware that they should take the ball away from where they won it back, because their opponent is less likely to have as many players on the blind side. They are also more and more aware that the ball should be shifted from side to side - preferably in a quick fashion - in order to find space between the lines. The thing that tends to set teams apart nowadays is their reaction to the moment they give the ball away. Sure, this is nothing that gets noticed on highlights, but take a closer look and see for yourselves. It can't be just a coincidence that the better teams are usually the ones that are better at defensive transitions - or do you really think Barcelona (for instance) is all about attack? Both Bruno César and Maxi are caught high up. None of the makes a foul to stop the breakaway. Benfica is about to have seven players in front of the ball. and tells his team-mates they should have "killed the play" when they could. Notice the difference the other way around. Artur has just released the ball for a quick breakaway. 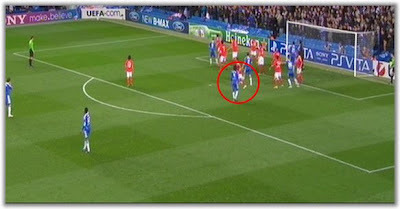 Realising how many men Chelsea had in front of the ball, Lampard quickly made the foul to stop the play. Conclusion. All of this can be dismissed as nothing more than tactical hooey, but more often than not, these are decisive moments for the outcome of any given match. Even though Benfica can get away with defensive carelessness on most matches in the Portuguese championship, the Champions League is much more competitive - and the big sharks don't mind taking their time.